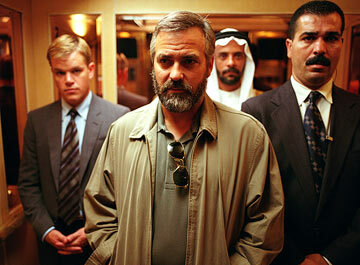 Syriana is, well, not an easy film to follow. It's about the global oil industry, terrorism and Middle-East politics. So many characters, so many different locations, so many subplots were going on that despite my brilliant mind, I had trouble following the film, then the trouble started subsiding, then, it came back, then it subsided again, and then came back, and subsided, until I was shifting from full understanding of the plot to slight confusion within minutes. Yet in the end, I knew enough to know that the ending was a depressing one. The CIA were portrayed as bastards whilst the business world was shown as a cesspool of immoral, manipulative rich men. Two American oil firms were merging, and they were involved in shady deals like bribery to achieve their goals. An oil broker (Matt Damon) has to deal with the death of his young son in a freak accident, then partners with a Gulf prince (who owns the hotel where the freak accident that killed Matt Damon's young son occurred). 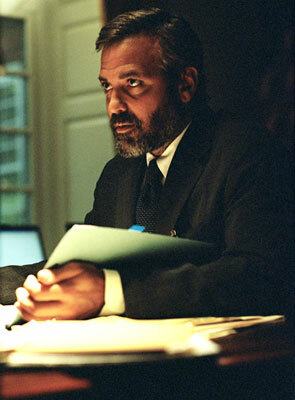 An ambitious attorney (Jeffrey Wright) has to help serve as the fixer for the merger between the two oil firms because they are being investigated by the Justice Department. A Pakistani youngster was getting increasingly involved in a deadly crusade against the oil firms. A middle-aged CIA agent (George Clooney in an Oscar-winning role) gets betrayed by an informant, and then gets betrayed by the CIA, poor guy was very much screwed. Argh, screw it, if you want a somewhat better synopsis, go read Hollywood Reporter's review. This film is more like a mind challenge, it doesn't really hit me that emotionally. But I guess it's sorta good. Was thinking that it was a thriller because of the trailer, but it's pretty talky and slow-moving. Not something I would watch again, but yeah, I guess it's all right. Hmm.